Output signal frequency high accuracy, good stability. Signal amplitude up to 20Vpp. Instrument can realize the adjustment program of function parameters , easy to use. Accompanying frequency meter, counter function, high cost. 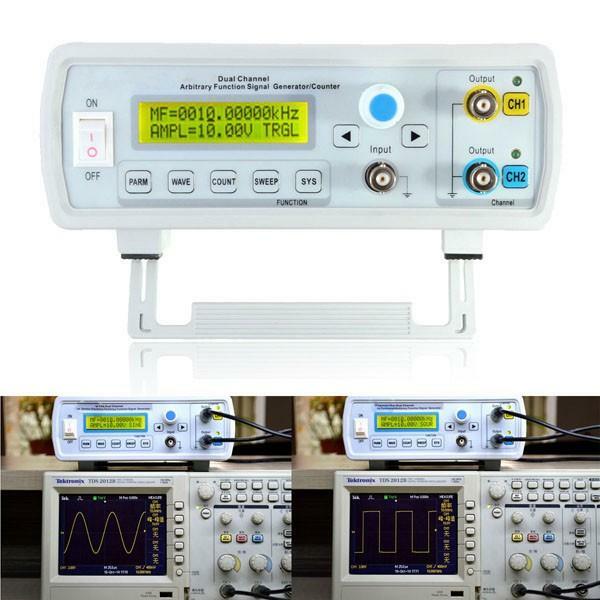 The instrument can output sine, square, triangle, ramp, pulse, staircase, DC voltage waveform. Pulse wave pulse width precision can be adjustable. 1. Using DDS direct digital synthesis technology to generate precise, stable, low distortion output signal. 2. CH1 and CH2 completely symmetrical two channels, each channel can be independently set the parameters. 3. Supports user-defined waveforms, each arbitrary waveform memory depth 2048 x 12bits, 250MSa / s sampling rate. 4. Has burst burst output, selectable manual trigger, internal and external trigger CH2 trigger three trigger modes that allow the unit to any output 1 - 1048575 bursts. 5. 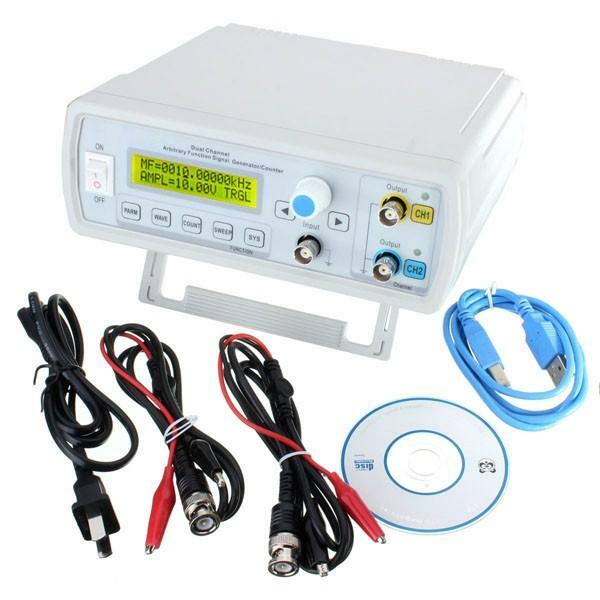 Measurement functions: instrument comes with 100MHz frequency counter functions and pulse counter functions. 6. Waveform generator up to 12 bits wide, the output waveform is more delicate, waveform distortion is reduced magnitude. 7. 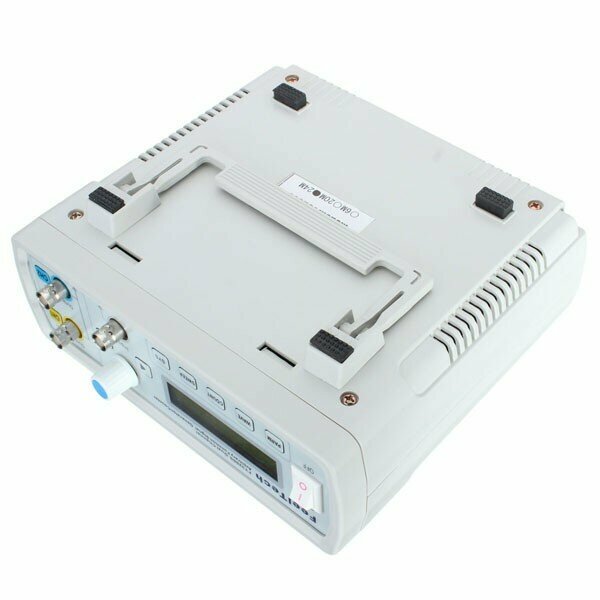 With full CNC functions, display and digital adjustment phase current amplitude of the output signal, offset, frequency, duty cycle, and the two signals. 8. After connecting the instrument to the computer, you can use the computer through the PC control signal generator functions and parameters, and can be edited on a computer to download arbitrary waveform output waveform to the instrument. 9. Communication: serial communication, protocol completely open, user-friendly secondary development. 10. High frequency accuracy: frequency accuracy up to 10-6 magnitude. 11. High frequency resolution: the full range of frequency resolution 10mHz. 12. Tracking function: built-in frequency, amplitude, offset, duty cycle, waveform and other parameters follow function, easy to use. 13. Scanning features: a frequency linear sweep and logarithmic sweep function, scan start and end points can be set. 15. Operation: key operation, LCD1602 LCD display in English, direct digital setting parameters or continuous adjustment knob. 16. Input voltage protection: extended power input range AC85V to AC240V wide voltage. 17. Output short circuit protection: All signal outputs can operate at over load short circuit 60S.